News of the World’s owner, News International, said Thursday that it will shut down the newspaper after Sunday's issue. Accusations that journalists at Rupert Murdoch’s UK newspapers hacked into the phones of politicians, celebrities and innocent people caught up in the news – including child murder victims – has severely bruised his media empire. It has forced the closure of Britian’s biggest-selling paper, a withdrawal for his bid for the broadcaster BSkyB and the resignation of his trusted UK chief executive Rebekah Brooks. November 2005 – News of the World prints a story about Prince William injuring his knee, prompting royal officials to complain to police about probable voice mail hacking. July 2007 – Goodman and Mulcaire sue the tabloid for wrongful dismissal. Goodman receives £80,000 and Mulcaire receives an undisclosed amount. June 2008 – News Group Newspapers pays a £700,000 settlement to soccer executive Gordon Taylor, whose phone was hacked by Mulcaire. November 2009 – Britain's Press Complaints Commission releases a report concluding that there is no evidence of continued phone hacking. March 2010 – A celebrity public relations agent agrees to drop his lawsuit against News of the World for a payment of more than £1 million. May 2010 – Coulson becomes the spokesman for British Prime Minister David Cameron. September 2010 – Former News of the World journalist Sean Hoare alleges that phone hacking was a common practice at the paper and encouraged by Coulson. January 21, 2011 – Coulson resigns as Cameron's spokesman because of coverage of the phone hacking scandal. January 26, 2011 – British Metropolitan Police launch a new investigation into voice mail hacking allegations at News of the World. April 5, 2011 – News of the World chief reporter Neville Thurlbeck and former editor Ian Edmondson are arrested on suspicion of intercepting voice mail messages. April 10, 2011 – News of the World officially apologizes for hacking into voice mails from 2004 to 2006 and sets up a compensation system for unnamed victims. April 14, 2011 – Senior News of the World journalist James Weatherup is arrested on suspicion of conspiracy to intercept communications. June 7, 2011 – Actress Sienna Miller settles with News of the World for £100,000 in damages and legal fees. June 23, 2011 – Freelance journalist Terenia Taras is arrested on suspicion of phone hacking. July 5, 2011 – It is revealed that News of the World journalists possibly hacked into then-missing teenager Milly Dowler's voice mail and deleted messages to free space, causing her parents to believe she was still alive. July 6, 2011 – Rupert Murdoch, CEO of News Corp., the parent company of News of the World owner News International, promises full cooperation with the investigation and calls the accusations against News of the World "deplorable and unacceptable." 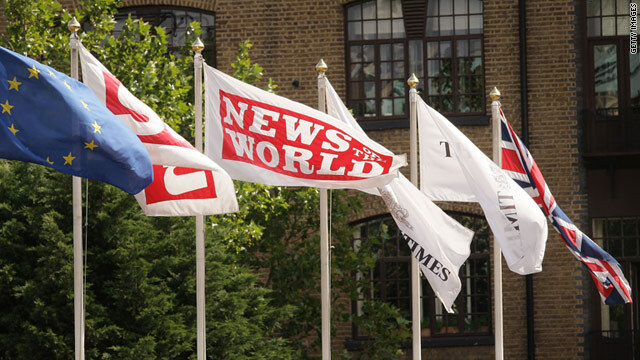 July 7, 2011 – News International announces that the July 10 edition of News of the World will be the paper's last. July 8, 2011 – Coulson, former communications chief to UK Prime Minister Cameron and former editor of News of the World, is arrested. Goodman, the paper’s former royal editor who served a four-month jail term in 2007 is also arrested on corruption allegations. Rupert Murdoch flies into London to take personal charge of the crisis. July 11, 2011 – Former UK Prime Minister Gordon Brown accuses other News International papers of illegally obtaining private information about him. July 12, 2011 – British lawmakers ask Rupert and James Murdoch and Brooks to testify before them. July 13, 2011 – News Corp. withdraws its bid to take over British satellite broadcaster BSkyB. UK Prime Minister Cameron announces a wide-ranging public inquiry into the British press. July 14, 2011 – The FBI launches an investigation into allegations that News Corp. employees or associates hacked into the phones of 9/11 victims, a federal source says. Rupert and James Murdoch agree to give evidence to a committee of British lawmakers. A 60-year-old man, widely reported to be Neil Wallis, a former executive editor of the News of the World, is arrested. July 15, 2011 – Brooks resigns as chief executive of News International. Les Hinton resigns as head of Dow Jones and publisher of The Wall Street Journal; he was Brooks' predecessor at News International. Rupert Murdoch visits the family of murdered teenager Milly Dowler, whose voice mail had been hacked. July 16, 2011 - Rupert Murdoch apologizes to the British public with full-page advertisements in seven national newspapers. July 17, 2011 - Rebekah Brooks is arrested, questioned for about 12 hours, and released on bail until October, police and her spokesman say. Metropolitan Police Commissioner Paul Stephenson – who leadsLondon’s police and is theUK’s highest ranking policeman – resigns. It comes after revelations that former News of the World executive editor Neil Wallis later become a communications consultant for the police. Stephenson says he decided to resign because increased scrutiny connected to the case would burden his department and detract from its accomplishments. July 18, 2011 - News International places further advertisments in UK newspapers, explaining how it is "putting right what's gone wrong"
Come on CNN love you, but Les Hinton WAS the publisher of The Wall Street Journal, not the Washington Post – that's a sloppy error. Just took a spin to http://www.foxnews.com......Not one tidbit about all this mess.. Tea anyone ? ,no party just tea. When is Murdoch going to accept responsibility for all the hate that he's spread through FOX? With great power comes great responsibility. Seems that Mr. Murdoch has forgotten that. Does anyone else find the coinicidence of the timeline an the fact that Mark Hurd was let go as a Board Member at the time Coulson also resigned (Sean Hoare alleges that phone hacking was a common practice at the paper and encouraged by Coulson) a bit eerie - considering Mr Hurd went before Congressional Hearing for similiar phone tapping while CEO of Hewlett-Packard – and was placed on the News Corps Board of Directors after beating that case? London Metro Police, reporters working together to listen to our voicemails for news stories or whatever. Obviously the invasion of privacy is so total and complete, one would have to close the internet and outlaw cell phones to stop it. It's because messages are not encrypted. All voice mails and emails should be encyrpted – decrypted end to end and should have electronic trip wires to signal illegal intercepts. Especially the police should be watched and blocked since they are most likely to have the motivation and ability to intercept illegally. WE should be given the ability and right to check the police and reporters voice mails if they aren't going to be prevented from invading our privacy. It is so unbelieveable especially reading throught the timeline it was one explosive things occurring after the next. UNBELIEVEABLE!!!! This story is incredible, you can't make this stuff up! true life is always more crazier than fiction. My brother suggested I would possibly like this website. He used to be entirely right. This submit actually made my day. You cann't consider simply how so much time I had spent for this information! Thank you! It's actually a great and helpful piece of information. I am satisfied that you shared this useful information with us. Please keep us informed like this. Thanks for sharing.